Is constructed of steel and uses standard concrete blocks as Ballast on Flat Roof. 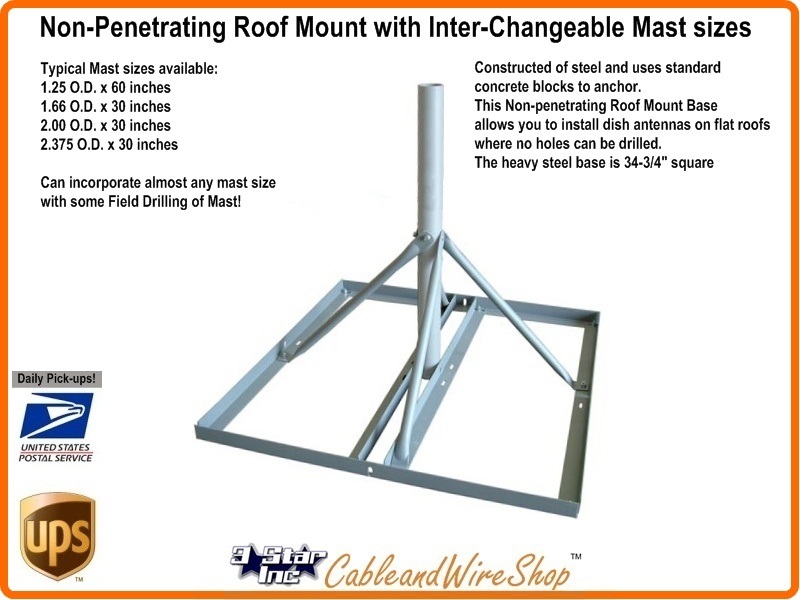 This Grey Powder Coat Finished Non-Penetrating Roof Mount Base allows you to install dish antennas on flat roofs where no holes can be drilled. The heavy steel base is 34-3/4" square. Powder Coat Finished Steel Mast is 2.00 inches in Outside Diameter and 30 inches in Height from Base. Perfect for use with Super DISH systems. Can be Used as a Penetrating Mount without Ballast when Field Drilled to use optional Pitch Pad Kit. Compares to Other Name Brand Hardware at Half the Price. Note: The 2.00 inch Diameter Pipe size mounts AU9S Dish, DirecTV 5 LNB Dish AU9 Slimline, WildBlue, SuperDISH, DirecTV Ka/Ku (HD Dishes), AT9, Satellite Dishes compatible with the SuperDMount, DBS Direct Broadcast Satellite and FTA Free to Air using a 2.00 inch OD Outside Diameter Mounting Pipe. In addition, it can be used in mounting some smaller Microwave PCS, Cellular, Broadband Wireless, Wireless Internet and Two Way Antennas compatible with 2 inch OD Pipe Mounting. And with a little Field Drilling, Screws and Pitch Pads are available as an option for Bolt-down versus Ballast applications. The Length of the mast is 30 inches based on engineering that incorporates consideration for Dish Antenna Wind-load versus the Ballast that would keep either on target with minimal deviation and flex. As with all Ballast mounts, Structural Engineering consultations are recommended for all Roof Applications.